Would you like to trade links? 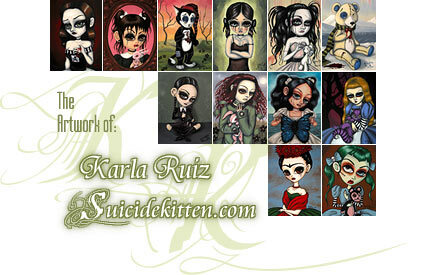 Link KarlaRuizArt.com to your links page, after doing so contact me at suicidekitten@yahoo.com to let me know that you have linked my page; I will get back to you and link your site as soon as I can. Visit my Ecrater where I have all my original art for sale! High-quality corsets from Vollers of England. Leather & PVC lingerie in regular and plus sizes.